Kevin and Tonya are having a girl! We are so excited! 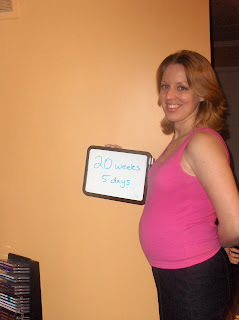 Today we are 20 weeks and 5 days into the pregnancy. Tonya is feeling very well! She is starting to feel some of the physical effects of carrying a baby around all day, and Kevin is getting lots of practice rubbing her back. Enjoy the pictures! Kevin is proud to show that he is no longer winning the belly size war. 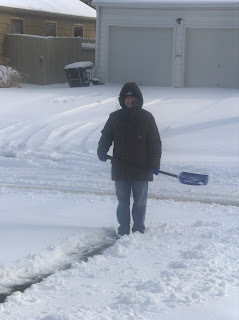 Monday we had 69 degree weather, Tuesday it started cooling and Wednesday Tonya had a snow day and Kevin shoveled 5 inches of snow from our driveway! We are so excited for a girl! Mackenzie is very happy and suggests "Crunendella" for the name.